A week ago, I began my series of posts on the drug business, starting with my perspective on how the business is changing and then moving on to posts on Valeant's business model and the runaway story of Theranos. 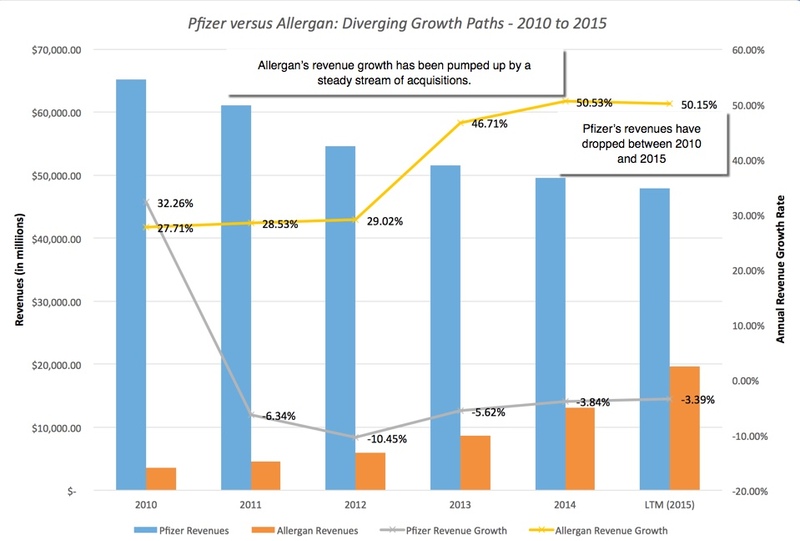 I am finishing this series with a post on Pfizer's plan to merge with Allergan and the economics of the merger. This deal, which will make one of the largest pharmaceutical companies in the world even larger has drawn attention not just because of its magnitude, but also for its motives. While there is some desultory chatter about synergy (as is the case with every merger), this deal seems focused on two specific motivations: the first is that this is a bid by Pfizer to buy Allergan's higher growth and the second is that this is a deal designed to save taxes. Not surprisingly, the latter is attracting attention not just from investors and financial journalists, but also from politicians. 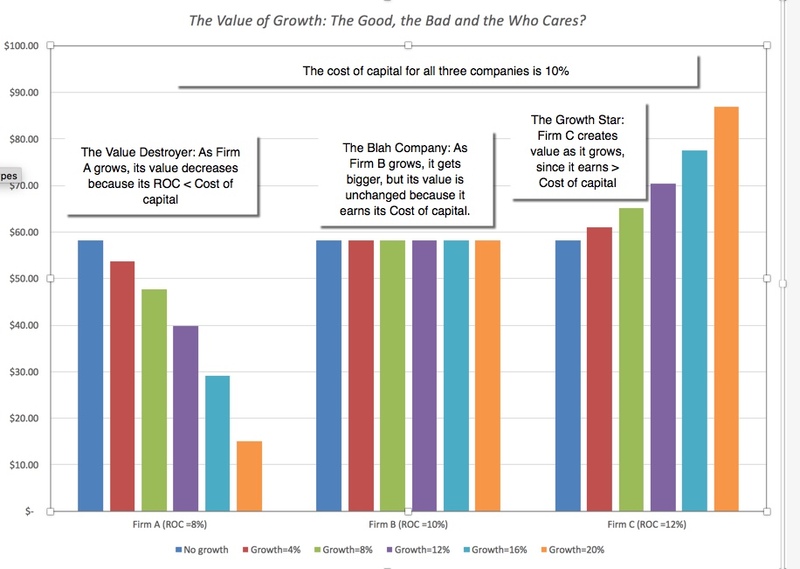 One of the most dangerous maxims in both corporate finance and investing is that it is better to grow than to not grow, and that a company that faces stagnant or declining revenues (and income) should seek out higher growth (at any price). In a post from a long time ago, I looked at the value of growth and noted that the net effect of growth depends on how much you pay to get it, and that overpaying for growth will give you higher growth and a lower value. 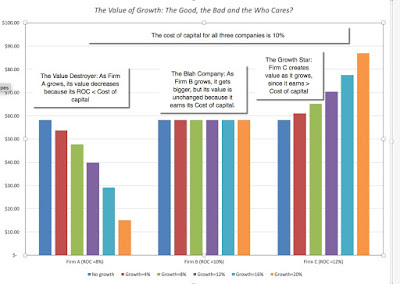 In the graph below, you can see the effect of growth on value for three companies, all of which grow, the first by making investments that generate returns that exceed the cost of capital, the second by making investments that earn the cost of capital and the third by making investments that earn less than the cost of capital. It is this perspective on growth that makes me skeptical about companies that grow through acquisitions, especially when those acquisitions are big and are of public companies. Since you have to pay market price plus (a premium of 20-30%) to acquire a public company, for a growth-motivated acquisition to create value, you have to be able to find a growth company that is under valued by more than 20% or 30%, given its growth rate, at the time that you initiate the deal to be able to walk away with value added. Note that, much as I am tempted to do a riff about the wondrous benefits of bringing both Botox and Viagra under one corporate entity, I am deliberately keeping synergy out of the equation since it can justify a premium. 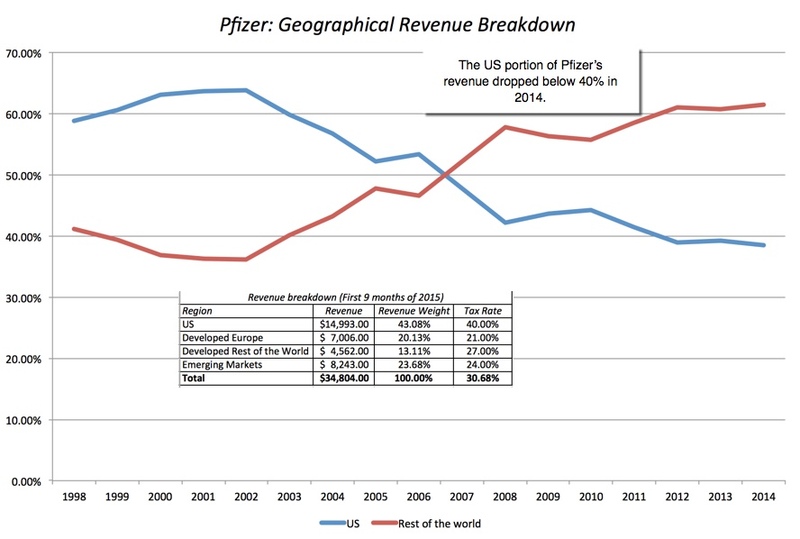 Over these five years, Pfizer's revenues shrank about 6% a year whereas Allergan's revenues grew at 40.62% a year. That makes the case for the acquisition, right? Not quite, because it depends on whether the market is already pricing in Allergan's growth. If it is, buying Allergan will allow Pfizer to grow faster, but not create value and may in fact destroy value if the premium paid is large enough. To examine whether Allergan offers growth at a bargain, I considered valuing Allergan, but very quickly abandoned the idea, because it reminded me of Valeant, insofar as it has grown rapidly through acquisitions, funded with significant amounts of debt and its financial statements are a mess. Thus, while it clear that Allergan has grown fast, the question of whether it has grown sensibly is a question that remains to be answered. Looking at the multiples at which Allergan was trading, prior to the Pfizer bid, there is almost no multiple on which it looks like a bargain. What is the bottom line? 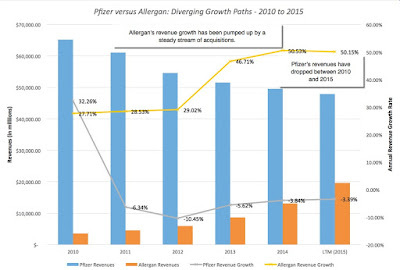 If I were a Pfizer stockholder, I would be concerned if buying growth were the primary reason for this acquisition, since the growth at Allergan is not only at a premium price but also untested (insofar as it is acquired growth rather than organic growth). I would be terrified, especially after recent scares, that the acquisition accounting at the company may be hiding bad surprises. 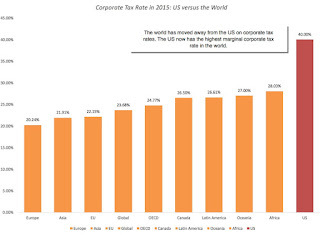 One of the most surprising aspects of this deal is how open the Pfizer management has been about the tax motivations for the deal, with Ian Read, the CEO of Pfizer, saying that "the company is at a tremendous disadvantage under the U.S. corporate tax code and that Pfizer is competing against foreign companies with one hand tied behind our back.” This planned "inversion", of course, has triggered a heated response, understandable (at least politically), though some of the critics don't quite understand the US tax law and what exactly Pfizer will gain by leaving behind its US incorporation. The Repatriation Trigger: To cap off this trifecta, US tax law adds a clause that specifies that the “additional US tax” due on foreign income has to be paid only when that income is repatriated to the United States. In response, US companies have had the logical reaction and not repatriated foreign income, leaving that income “trapped” in foreign locales. In 2015, it was estimated that the trapped cash amounted to more than $2 trillion, money that cannot be used to pay dividends, buy back stock or make investments in the US, but can be used to make investments anywhere else in the world. No US taxes on foreign income: While the company will continue to pay the US tax rate on its US income, its foreign income will be taxed only at the foreign domicile's tax rate. Untrap cash: To the extent that the company has built up trapped earnings (in foreign locales) that it is restricted from using, it can release the cash without any tax penalties. 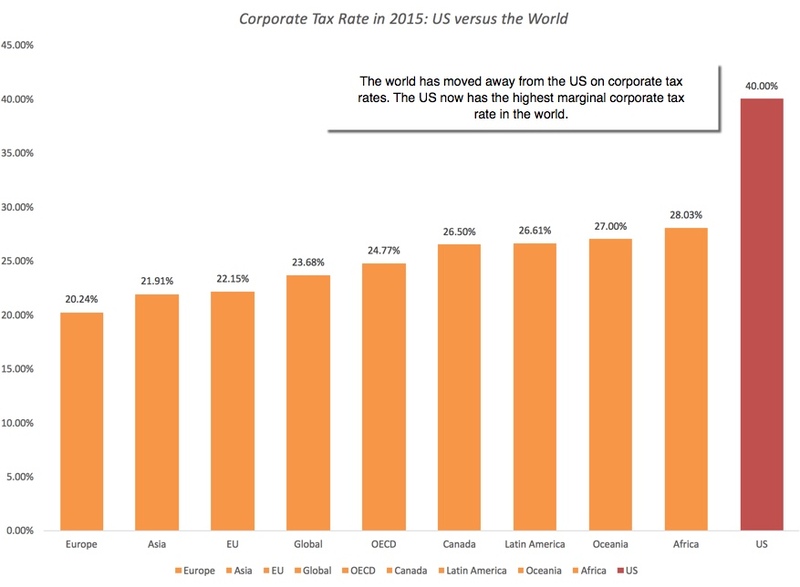 Given US tax law, the question is not why some companies seek to leave its tax jurisdiction, but why more of them do not, and the answer lies in an uneasy middle ground, a wait-it-out scenario that many US companies have adopted, where they let income accumulate in foreign markets and wait for one of two developments. One is a change in US tax law, which people on both sides of the aisle seem to agree is needed, but don't seem to want to bring to fruition. The other is that Congress will blink yet again and pass another one of its "tax holidays", a "once in a lifetime" chance (that shows up once every decade) that will be given to companies to bring their cash home with no penalties. The net effect is that the US ends up with the worst of all worlds: a tax code that is ineffective at collecting taxes (as evidenced by the drop in corporate tax collections over the last three decades) while encouraging companies to borrow more and more money (and save on taxes at the marginal rate). 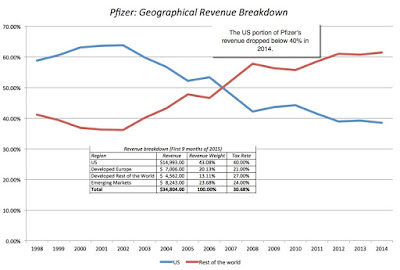 Note that Pfizer generated only 43.08% of its revenues in the first nine months of 2015. If Pfizer were to be taxed, at the marginal rate in each region, based on where it generated its revenues (regional tax), its tax rate in those nine months would have been 30.68%. As a US company, though, Pfizer would have to pay almost 40% of this income as taxes, translating into significantly higher taxes each period. Pfizer, of course, chose not to take this course, as manifested in two numbers. The effective tax rate that Pfizer has paid over the last five years has averaged to 23.45%, well below 40%, and a significant portion (my rough estimate is $12 billion) of Pfizer’s cash balance of $20.66 billion is trapped. Binging it back will result in a tax bill of $1.99 billion (using a differential tax rate of 16.55%, the difference between the US marginal tax rate of 40% and the effective tax rate of 23.45%). To illustrate the impact that changing the tax code that governs Pfizer has on its value, I considered three scenarios. Patriot Games: In this scenario, I assume that Pfizer does its patriotic duty (as some critics would label it) and not only decide to bring all of its trapped cash home today (and pay the differential taxes) but repatriate all of its foreign income each year back to the US and pay a 40% marginal tax rate on that income. Wait-it-out (Tax Limbo): In this scenario, Pfizer will leave its trapped cash overseas, continue to pay taxes to foreign governments on foreign income but not repatriate the cash. That will leave their effective tax rate well below the US marginal tax rate and Pfizer will have to hope that US tax law gets fixed or that Congress does another one of its “once in a lifetime” tax holidays. Go Irish: In this scenario, Pfizer buys Allergan and meets the requirements for shifting its incorporation to Ireland. Note that doing so does not affect their taxes on US income but it will not only un-trap their cash but also remove the constraint they face today on foreign income. Patriot Games 40% 40% 40% Return immediately & pay taxes now. Wait-it-out (Tax Limbo) 40% 23.45%, with taxes on deferred taxes paid in year 10. 40% Return in ten years & pay taxes then. The rationale for an inversion is that it will increase Pfizer’s equity value by $27.2 billion and its share price by $4.69 per share. This calculation, though, is based on the assumption that US tax law will never change, and that its dysfunctional components will continue in perpetuity. If you assume that the current bipartisan talk of fixing the law will result in changes (in either the corporate tax rate or in the global tax feature), the value increase will drop off substantially. I applaud Ian Read's focus on shareholder value but will this deal create that value? I am skeptical and here is why. Even if you accept the upper limit of the value of inversion ($27.2 billion), that increase in value does not incorporate two potential costs associated with inversion. The new rules covering inversions will require that Pfizer go through contortions to qualify and some of these contortions will add to the cost of the deal. There is the possibility of a backlash, not so much from customers, but from politicians. There are senators who are already threatening the company with consequences, though I am not sure that any of them would actually go as far as to ban or restrict Pfizer product sales in the US (since that would hurt those who need the drugs the most). Even if they do, given that the US Senate is disproportionately composed of older men, I am confident that they will carve out a "Viagra exception" for themselves. There is a second and even bigger concern that I would have as a Pfizer stockholder. If the rumors that Pfizer is planning to pay a 30% premium are right, that would translate into a premium of more than $30 billion over Allergan's market capitalization to buy the company. Since the growth is already priced in (at least in my view), the only way you can create value is to draw on synergy and nothing that either company has said suggests any concrete benefits from the combination. The bottom line is that this looks like a bad deal for the wrong company, at the wrong time and at the wrong price, the wrong company because Allergan's accounting statements are a mine field due to acquisition accounting, the wrong time because we may actually be on the verge of a major change in US corporate tax code and at the wrong price because of the premium on an already large market capitalization. As I was writing this post last week, I had a conversation with a friend about Pfizer. After I explained why I thought the Pfizer plan to acquire Allergan made sense, given the tax code and Pfizer's global exposure, her response was that Pfizer should not do this because “it is immoral". While I was floored initially by her assertion, it would be have been both futile and hubristic for me to try to prove her wrong. She is entitled to her moral judgments, just as I am entitled to mine, but it is moral, rather than economic, differences that usually lie at the heart of tax debates and that is perhaps why it is so difficult to get a consensus. If you own a business that would benefit from shifting away from the US for tax reasons, and you have patriotic or moral reasons for not doing so, you are well within your rights in staying US-bound and I support you in your choice. If you are the manager of a publicly traded company and you face the same choice, I am afraid that you cannot impose your patriotic or moral judgments on your stockholders. Not only are many of them foreign investors (with a very different sense of what comprises patriotism), but quite a few of them will part ways with you on your judgment that maximizing taxes paid to the government is a moral calling. I saw the new Steve Jobs movie, with the screenplay by Aaron Sorkin, over the weekend. As a long-time Apple user and investor, I must confess that I was bothered by the way in which the film played fast and loose with the facts, but I also understand that this is a movie. Sorkin clearly saw the benefit of using the launches of the Macintosh in 1984 and the iMac in 1997 as the bookends of the movie and the tortured relationship between Jobs and his daughter to create an emotional impact, and took dramatic license with the truth. As I watched the movie though, I kept thinking about Theranos, a company with a gripping narrative and a CEO who, like Steve Jobs, wears only black and who seemed headed for a biopic until a few weeks ago. The Theranos story has its beginnings in March 2004, when Elizabeth Holmes, a 19-year old sophomore at Stanford, dropped out of college and started the company. The company was a Silicon Valley start-up with a non-Silicon Valley focus on an integral, but staid part, of the health care experience, the blood test. Ms. Holmes, based on work that she had been doing in an Stanford lab on testing blood for the SARS virus, concluded that she could adapt technology to allow for multiple tests to be run on much smaller quantities of blood than the conventional tests did and a quicker and more efficient turn around of results (to doctors and patients). In conjunction with her own stated distaste for the needles required for conventional blood tests, this became the basis for the Theranos Naotainer, a half-an-inch tube containing a few drops of blood that would replace the multiple blood containers used by the conventional labs. The story proved irresistible to just about everyone who heard it, her professor at Stanford who encouraged her to start the business, the venture capitalists who lined up to provide her hundreds of millions of dollars in capital and health care providers who felt that this would change a key ingredient of the health care experience, making it less painful and cheaper. The Cleveland Clinic and Walgreens, two entities at different ends of the health care spectrum, both seemed to find the technology appealing enough to adopt it. The story was irresistible to journalists, and Ms. Holmes quickly became an iconic figure, with Forbes naming her the “the youngest, self-made, female billionaire in the world” and she was the youngest winner of "The Horatio Alger award" in 2015. From the outside, the Theranos path to disrupting the business seemed smooth. The company continued to trumpet its claim that the drop of blood in the Nanotainer could run 30 lab tests and deliver them efficiently to doctors, going as far as listing prices on its website for each test that were dramatically lower (by as much as 90%) than the status quo. In venture capital rankings, Theranos consistently ranked among the most valuable private businesses with an estimated value in excess of $9 billion, making Ms. Holmes one of the richest women in the world. The world seemed truly at her feet and reading the news stories, the disruption seemed imminent. 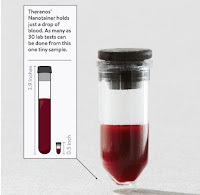 The Theranos story started to come apart on October 16, when a Wall Street Journal article reported that the company was exaggerating the potential of the Nanotainer and that it was not using it for the bulk of the blood tests that it was running in house. More troubling was the article’s contention that senior lab employees at the company found that the nanotainer’s blood test results were not reliable, casting doubt on the science behind the product. In the following days, things got worse for Theranos. It was reported that the FDA, after an inspection at Theranos, had asked the company to stop using the Nanotainer on all but one blood test (for Herpes) because it had concerns about the data that the company had supplied and the product's reliability. GlaxoSmithKline, which Ms. Holmes had claimed had used the product, asserted that it had not done business with the start up for the previous two years and the Cleveland Clinic also backed away from its adoption. Theranos initially went into bunker mode, trying to rebut the thrust of the critical articles rather than dealing with the substantial questions. It was not until October 27 that Ms. Holmes finally agreed that presenting the data that the Nanotainer worked as a reliable blood testing device would be the most “powerful thing” that the company could do. It is entirely possible that the data that the company has promised to deliver will be so conclusive that all doubts will be set aside, but it does seem like the spell has been broken. The Runaway Story: If Aaron Sorkin were writing a movie about a young start up, it would be almost impossible for him to come up with one as gripping as the Theranos story: a nineteen-year old woman (that already makes it different from the typical start up founder), drops out of Stanford (the new Harvard) and disrupts a business that makes us go through a health ritual that we all dislike. Who amongst us has not sat for hours at a lab for a blood test, subjected ourselves to multiple syringe shots as the technician draw large vials of blood, waited for days to get the test back and then blanched at the bill for $1,500 for the tests? To add to its allure, the story had a missionary component to it, of a product that would change health care around the world by bringing cheap and speedy blood testing to the vast multitudes that cannot afford the status quo. The mix of exuberance, passion and missionary zeal that animated the company comes through in this interview that Ms. Holmes gave Wired magazine before the dam broke a few weeks ago. As you read the interview, you can perhaps see why there was so little questioning and skepticism along the way. With a story this good and a heroine this likeable, would you want to be the Grinch raising mundane questions about whether the product actually works? The Black Turtleneck: I must confess that the one aspect of this story that has always bothered me (and I am probably being petty) is the black turtleneck that has become Ms. Holmes’s uniform. She has boasted of having dozens of black turtlenecks in her closet and while there is mention that her original model for the outfit was Sharon Stone, and that Ms. Holmes does this because it saves her time, she has never tamped down the predictable comparisons that people made to Steve Jobs. If a central ingredient of a credible narrative is authenticity, and I think it is, trying to dress like someone else (Steve Jobs, Warren Buffett or the Dalai Lama) undercuts that quality. I apologize if I am hurting anyone’s feelings, but my first reaction as I was reading through the list was “Really? He is still alive?”, followed by the suspicion that Theranos was in the process of developing a biological weapon of some sort. This is a board that may have made sense (twenty years ago) for a defense contractor, but not for a company whose primary task is working through the FDA approval process and getting customers in the health care business. (Theranos does some work for the US Military, though like almost everything else about the company, the work is so secret that no one seems to know what it involves.) The only two outside members that may have had the remotest link to the health care business were Bill Frist, a doctor and lead stockholder in Hospital Corporation of America, and William Foege, worthy for honor because of his role in eradicating small pox. My cynical reaction is that if you were Ms. Holmes and wanted to create a board of directors that had little idea what you were doing as a business and had no interest in asking, you could not have done much better than this group of septuagenarians. My sense of Ms. Holmes's unquestioned authority was reinforced when I read a December 2013 letter that she sent to investors in the company, asking them to agree to a five for one stock split and the creation of two classes of shares with different voting rights (class A would have one vote per share and class B would get 100 votes per share), with Ms. Holmes retaining the voting shares and voting control of the company. Lest I be accused of being sexist in begrudging her this power, I have been just as harsh in my assessments of Mark Zuckerberg (with Facebook) and the Brin/Page duo (with Google) for their desire to raise money from investors but not give them a proportional say in how the business gets run, and Ms. Holmes has not quite earned the rights (that Zuckerberg and Brin/Page have claimed) to be a corporate dictator. I would like to believe that I would have asked some fundamental questions about the science behind the product and how it was faring in the FDA approval process, if I had been a potential investor or journalist. However, it is entirely possible that listening to the story, I too would have been tempted to go along, wanting it so much to be true that I let hope override good sense. Some of my worst mistakes in investing (and life) have been when I have fallen in love with a story so much that I have willed a happy ending to it, facts notwithstanding. The question of whether Theranos makes it back to being a valuable, going concern rests squarely on the science of its product(s). If the Nanotainer is a revolutionary breakthrough and what it needs is scientific fixes to become a reliable product, there is hope. But for that hope to become real, Theranos has to be restructured to make this the focus of the business and become much more transparent about the results of its tests, even if they are not favorable. Ms. Holmes has to scale back many of her high profile projects (virtuous and noble though they might be) and return to running the business. If the Nanotainer turns out to be an over hyped product that is unfixable, because it is scientifically flawed, Theranos has a bleak future and while it may survive, it will be as a smaller, low profile company. The investors who have put hundreds of millions in the company will lose much of that money but as I look at the list, I don’t see any of them entering the poor house as a consequence. There is a chance that the lessons about not letting runaway stories stomp the facts, never trusting CEOs who wear only black turtlenecks and caring about governance and oversight at even private businesses may be learned, but I will not hold my breath expecting them to have staying power. 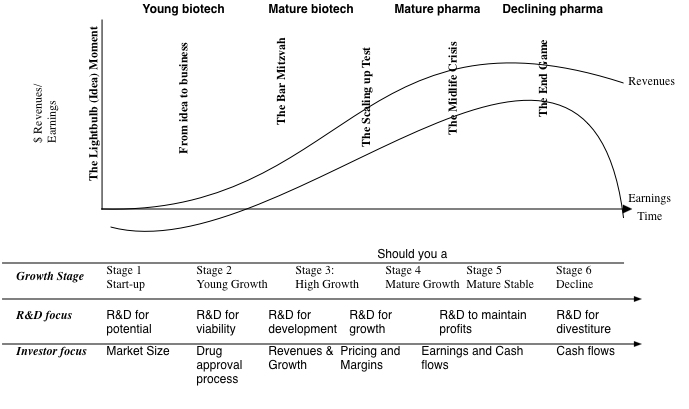 In my last post, I looked at how the pharmaceutical and biotechnology businesses have diverged, especially in the last decade, and the implications for earnings, R&D and market pricing of these companies. The pharmaceutical business, in particular, faces a new landscape with many companies still stuck with a business model that does not work in delivering value, as growth eases and margins come under pressure. It is no surprise therefore that investors are looking for a drug company with a new business model, and that may explain the meteoric rise of Valeant over the five years, making its recent collapse all the more shocking. 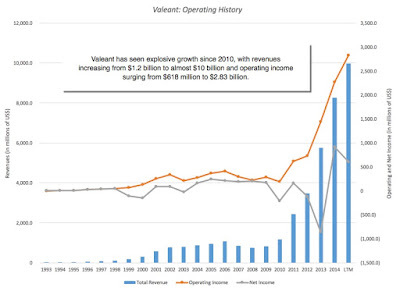 As you can see, the inflection point is in 2010, when Valeant went from a company with small, slow-growing revenues into hyper speed, increasing revenues almost ten fold between 2010 and 2015. That increase in revenues was accompanied by increases in operating income and net income, albeit smaller in proportional terms. 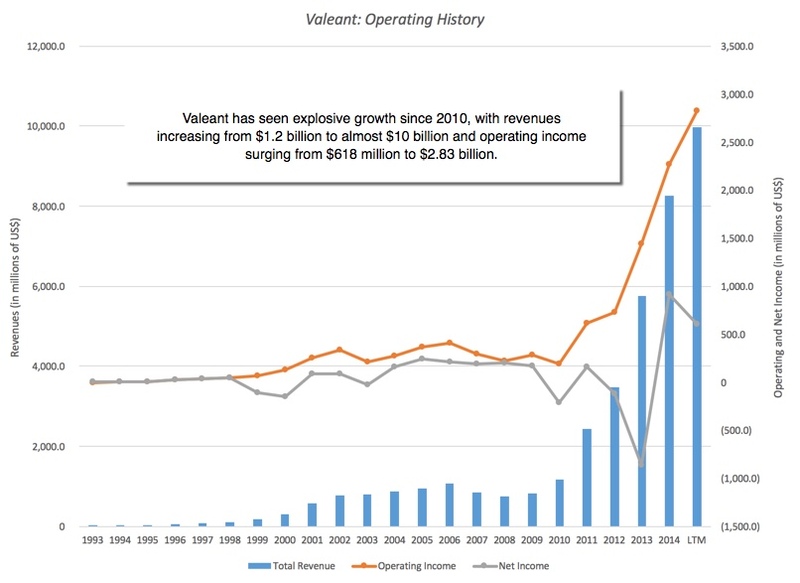 The story of how Valeant was able to accelerate its growth has been widely told, but the numbers again tell it better. At least during this period, the market liked the Valeant business model of growth through acquisitions, and delivered its verdict by pushing up Valeant's market capitalization and pricing multiples. Recognizing that it faced a major market calamity, Valeant called a press conference on October 26, where they tried to clear the air, succeeding only in making it murkier by the time they were done. In the days since, the piling on has begun with even long time investors in the company finding aspects of the company that they had never liked. The stock price dropped below $80 per share on November 5, down more than 60% from its peak in August. In fact, things have gotten so bad that the CEO of Valeant, Michael Pearson, was forced to sell $100 million of his shares in the company to cover a margin call. The formula that Valeant used to grow exponentially, i.e., acquiring smaller companies and bringing them under one corporate umbrella, is not new, and given the mixed track record of companies that have tried it, it is not generally greeted with the rapturous response that Valeant received. To add to the puzzle, many of the investors who were drawn to the stock were from the old-time value investing crowd, with the Sequoia Fund and Bill Ackman among its biggest cheerleaders. So, what is it that attracted these presumably hard-headed investors to the Valeant business model? Buy low, sell high: I believe that value investors were attracted to Valeant because it seemed to adapt an old-time value investing maxim of buying "cheap and selling expensive" to the drug market. At the risk of over simplifying Valeant's strategy, a central focus of its acquisition strategy was buying companies that owned the rights to "under priced" drugs and repricing to what the market would bear. Use debt capacity: One of the enduring mysteries of the drug business, where mature companies have large and stable cash flows from developed drugs, is why these companies do not borrow more to take advantage of the tax code's tilt towards debt. 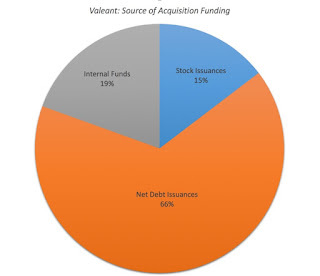 As you can see from the funding pie chart above, Valeant seemed to have no qualms about using its borrowing capacity to fund its acquisitions. R&D is not sacred: In my last post on the drug business, I noted the reduced payoff (in growth) to R&D expenditures at pharmaceutical companies and the unwillingness on the part of these companies to draw back their R&D expenditures. Again, Valeant seemed to be one of the few companies in the business that viewed R&D like any other capital investment and scaled it back, as the payoff decreased. Quick conversion into earnings: Many acquisitive companies fail at converting great sounding stories into earnings, but Valeant seemed to be exception. Its acquisitions seemed to translate quickly into revenues and operating income, vindicating their strategy, though you had to take the company's word that its acquisition-related expenses were transitional and one-time charges. As an added bonus, Valeant used its acquisition-related expenses to keep its tax bill low, getting tax credits from 2011 to 2013 and keeping its effective tax rate below 10% in the most recent twelve months. The collapse of Valeant's stock price has created more than the usual second guessing and rewriting of history, with some glee mixed in, given the pedigree of the investors who have lost money on the company. While my deep seated skepticism about acquisitions has meant that I was never tempted to buy Valeant, even in the good times, I understand its appeal to investors. 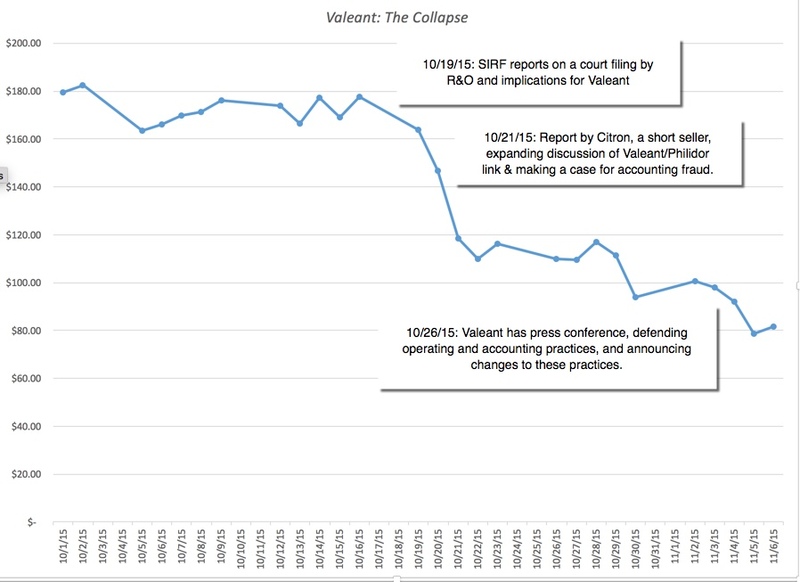 In a business (pharmaceuticals), where inertia and denial seem to drive management decisions at most companies, Valeant looked like an outlier with a business template that worked. I have argued in prior posts that big shifts in intrinsic value don't come from earnings surprises or market panics, but from big changes in narrative. The question that investors (both current and potential have to ask about Valeant is whether the company narrative has been altered enough by the news stories that we are reading for it to lose more than half of it's value. If you accept my description of the Valeant business model (acquisitions focused on repricing drugs, funded with debt and quickly converted into earnings), there is reason to believe that a critical portion of the Valeant's business model is broken and cannot be fixed. Health care is different: Unlike perfume, soda or an automobile, where charging what the customer will pay is exactly what businesses should aspire to do, it seems inhumane and perhaps even immoral to push prices up 60% or 70% for medicine that patients need. Even if you don't have moral objections to the practice, you may still have issues with it as a citizen and taxpayer, since these costs are spread across all of us through the health insurance system. It is surprised that Valeant has not been subject to more scrutiny for this practice, but it was becoming clear even before the recent blow up that the company was drawing attention, as evidenced by this article in the New York Times on October 14 (a few days before the short seller stories appeared in the press). Now that Valeant is in the public eye, there is no way that, even if this scandal passes, they can return to anonymity. Every drug price increase for a Valeant drug will be held up to scrutiny and subject to second guessing and any target company that want to fight off a Valeant acquisition bid will now be pre-armed. Distribution network: The distribution and sale of drugs is different from most other conventional businesses, with doctors, pharmacies and insurance companies all operating in constrained environments, with the constraints becoming more binding with changes in health care laws. Thus, doctors are asked to consider the relative prices of drugs when writing prescriptions and pharmacies are under pressure from insurance companies to consider cost when filling these prescriptions. 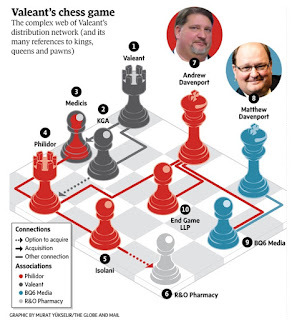 As I read the news stories about the pharmacies controlled by Valeant, my suspicion is that the company used this convoluted network (see the picture below from the Globe and Mail about Valeant's holdings) to extract higher prices through to insurance companies and patients, rather than as device to cook its accounting books. Now that the relationship has come to light, it is probable and perhaps even likely that if this type of relationship is legal now, it will get more regulated or even banned in the future. Complexity: Valeant is a complex company, and its complexity is brought home by both the bulk of its annual filing (its last 10K from 2014 runs 537 pages) and its detail. That complexity comes partly from its strategy of growing through acquisitions and partly from the accounting for acquisitions, but some of it is clearly by design (with the pharmacy network and chess names for holdings). Complexity is a double-edged sword, though, since in good times, investors assume the best about the things that they do not know or understand and in bad times, the fog created by complexity creates a backlash. As with every scandal, I am sure that there will be new revelations and news stories in the week ahead, some pointing to accounting problems, some to business model failures and some to legal jeopardy. Even if Valeant emerges unscathed legally from this mess, I just don’t see how they can revert to their old business model, and it is not clear to me that without it, they are anything more than a middling pharmaceutical company. 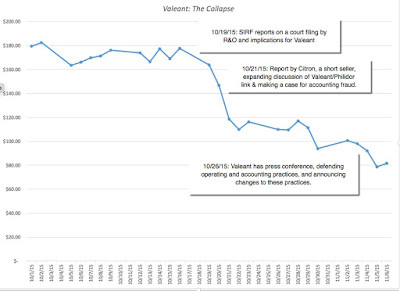 Does the imminent collapse of Valeant's core business model imply that I agree with the short sellers who have used the Enron analogy to argue that this company is a shell worth nothing? No, and here is why. Unlike Enron, a company that used special purpose entities and complex holdings to hide it debt and had no assets with tangible value at the time of its troubles, Valeant pharmacy holdings seem designed more for pricing power than accounting sleight of hand and it owns assets that have real value. Thus, even if Valeant's capacity to grow productively is removed tomorrow, it will still have value as a going concern or as a collection of assets. R&D spending: I will assume that Valeant will have to invest in R&D to keep this growth going, and in my valuation, that investment will reflect the return on capital of 15.25% that I have estimated for the company (with the adjusted earnings). Cost of capital: Factoring in both the good side of Valeant's high debt ratio (the tax effected cost of debt) and the bad side (higher cost of debt and equity) and the revenue exposure for Valeant (75% from developed markets, 25% from emerging markets), I estimate a cost of capital of 7.52%. Given my perspective on the company, and it is undoubtedly flawed, I don't see Valeant as a significantly under valued stock, in spite of the price drop over the last few weeks. I also don't see it as bubble waiting to burst, a stock heading towards being worth nothing. For the moment, I think will sit on the sidelines and watch. If this scandal has legs and not only lingers, but creates legal problems that taint Valeant as a corporation, there is a second option. Just as Valeant’s rise in value was built on additions, you could create a reverse strategy where value is generated by subtraction. Thus, Valeant could sell itself piece by piece (drugs and divisions) to the highest bidders, since each piece will be worth more to an untainted buyer than it would be worth to Valeant. If this is the optimal path, it will be interesting to see if this team that has built the company up over the last five years is willing to set aside hubris and break it down over the next few years. The Valeant story reinforces many of my existing biases against companies that grow primarily through acquisitions. I am willing to concede that this strategy can pay off, if companies maintain discipline, but my experience with these companies is that they inevitably hit a wall, either because they become too large to stay disciplined or because the accounting creates too many opportunities to obfuscate and hide problems. While Valeant's attempt at creating a new model for a drug business may have failed, that does not make the existing drug company model a success either. The search has to go on! In the last two weeks, I have started writing about Pfizer’s courting of Allergan, the epic fall of Valeant and the unraveling of the Theranos story, but I have held back because all three stories have to be set against the backdrop of the changing health care business. While there are numerous stories being told about how this is changing, I decided that it made sense to start by looking at the evolution of the health care business over the last 25 years and how changes in its core characteristics may explain all three stories. To understand the drug business, I went back to 1991, towards the beginning of a surge in spending in the US on health care. The pharmaceutical companies at the time were cash machines, built on a platform of substantial up front investments in research and development. The drugs generated by R&D that made it through FDA approval and into commercial production were used to cover the aggregated cost of R&D and to generate significant excess profits. The key to this process was the pricing power enjoyed by the drug companies, the result of a well-defended patent system, significant growth in health care spending, splintered health insurance companies and lack of accountability for costs at every level (from patients to hospitals to the government). In this model, not surprisingly, investors rewarded pharmaceutical companies based on the amounts they spent on R&D (secure in their belief that the costs could be passed on to customers) and the fullness and balance of their product pipelines. So, how has the story changed over the last decade? The rise in health care costs seems to have slowed down and the pricing power of drug companies has waned for many reasons, with Obamacare being only one of many drivers. First, we have seen more consolidation within the health insurance business, potentially increasing their bargaining power with the pharmaceutical companies on drug prices. Second, the government has used the buying clout of Medicaid to bargain for better prices on drugs, and while Medicare still works through insurance companies, it can put pressure on them to negotiate for lower costs. Third, the pharmacies that represent the distribution networks for many drugs have also been corporatized and consolidated, and are gaining a voice in the pricing process. The net effect of all of these changes is that R&D has much more uncertain payoffs and has to evaluated like any other large capital investment, that it is good only when it creates value for a business. Consequently, investors have had to become more measured in their judgment of R&D spending at drug companies, rewarding companies for spending more on R&D only if it is productive and punishing them when it is not. The diminished pricing power story is not a new one and others have made the points that I have but it is still just a story. The real question is whether the numbers back the story and to answer that question, I looked at key operating metrics for publicly traded drug companies from 1991 to 2014, with the intent of eking out trends in the numbers. The growth in health care costs continued into the last decade, albeit at levels much more moderate than in the 1990s, but the big story was the rise of biotechnology companies in the space. At inception, the distinction between pharmaceutical and biotech companies wass the method by which they produced drugs, with pharmaceutical firms working with chemicals and biotechnology companies using live organisms (bacteria, cells or yeast) to generate their drugs. Given that both R&D processes are designed to generate drugs that go through similar FDA approval processes and get sold through the same distribution channels, this difference is one that only scientists can relate to, and one that is becoming meaningless as R&D departments at both groups poach on the other's territory. The rest of the differences that people point to between the two, i.e, that biotech companies spend more time on research, tend to lose money and are riskier than pharmaceutical firms have less to do with business differences than life cycle differences. In the picture below, I look at the aggregate revenues reported by pharmaceutical and biotechnology companies from 1991 to 2014. 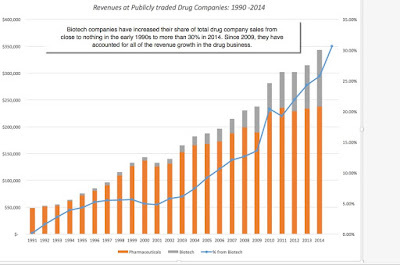 Note that by the last decade, and especially since 2010, almost all of the growth in the drug business has come from the biotech companies, with pharmaceutical companies reporting flat revenues between 2010 and 2014. 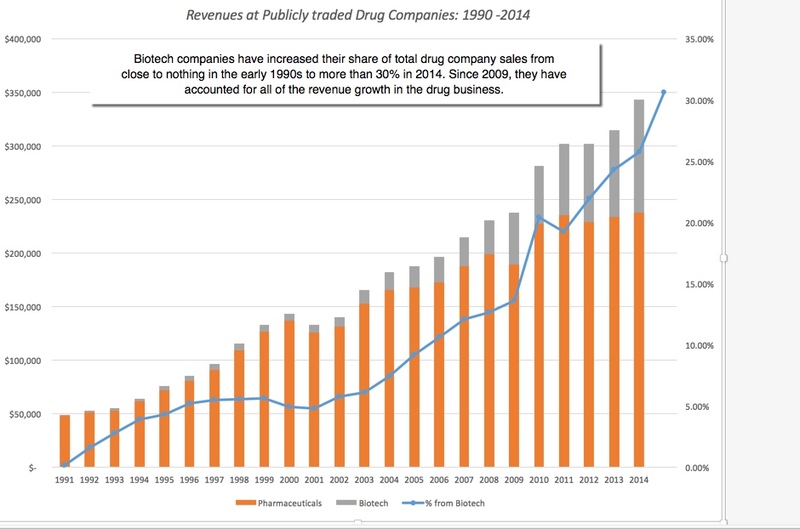 In 2014, biotech companies accounted for 30.63% of total revenues at drug companies, up from 19.23% in 2010. 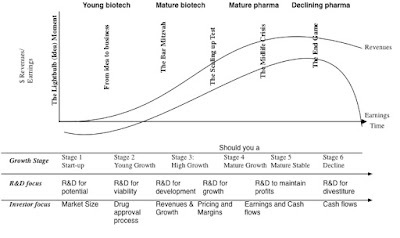 The generalization that biotech companies tend to be younger and earlier in the life cycle is being put to the test as some biotech companies age. In 2014, for instance, four of the top ten drug companies in the US, in revenues, were biotechnology companies. In fact, many of these companies have blurred the line between pharmaceutical and biotechnology companies further, and some like Pfizer describe themselves as biopharmaceutical companies. The Money Machine: Profitable but for how long? In keeping with the hgh pricing power story, pharmaceutical companies have always been able to enjoy sky-high operating margins, a fact rendered even more impressive by the fact that the accounting at these companies treats R&D, the biggest capital expenditure that these firms have, as an operating expense (thus depressing reported profits and margins). In the graph below, I look at the evolution of operating margins at pharmaceutical and biotech companies from 1991 to 2014, using two measures, one looking at operating profit (EBIT) as a percent of sales and one with R&D added back to operating income (EBITR&D) estimates as a proportion of sales. On the surface, at least, no one will shed tears for pharmaceutical companies since companies in most other sectors would gladly trade for their margins. In fact, while operating margins for pharmaceutical companies have dropped from their highs in 2001 and 2002, they are not very different from what they were in the 1990s. 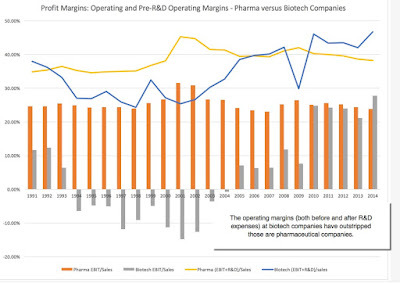 The story again, though, is in the biotech space, where companies have moved from losing money in the early 1990s to collectively generating higher margins than pharmaceutical firms, with the difference being even more pronounced on a pre-R&D basis. The Payoff to R&D: No longer a slam dunk! The argument for spending money on R&D has always been a simple one. By investing in R&D, you are investing for future growth and it is an equation that has held well for much of the last 25 years. In the table below, I report revenue growth and R&D expenses as a percent of sales each year for pharmaceutical and biotech companies each year from 1991 to 2014. Notwithstanding its limitations, this ratio illustrates the biggest divergence between the two subsectors, dropping close to zero for pharmaceutical firms from 2010-14 time period, while remaining relatively healthy (though lower then in earlier periods) for biotech companies. What does this all mean? First, this table suggests that pharmaceutical companies have not cut back on internal R&D spending as much as some stories suggest that they have and that much of the slack has been picked up by biotech companies. Second, this table also suggests that pharmaceutical companies should be spending less money on R&D, not more, as the growth payoff to R&D becomes lower and lower. Third, it provides at least a partial explanation for why some pharmaceutical companies have embarked on the acquisition path, focusing on buyer younger, smaller companies for the products in their research pipeline. As the operating metrics for pharmaceutical and biotech companies have changed, the market has also adjusted to reflect these changes, though the argument always can be made that it has adjusted too slowly and not enough or too fast and too much. 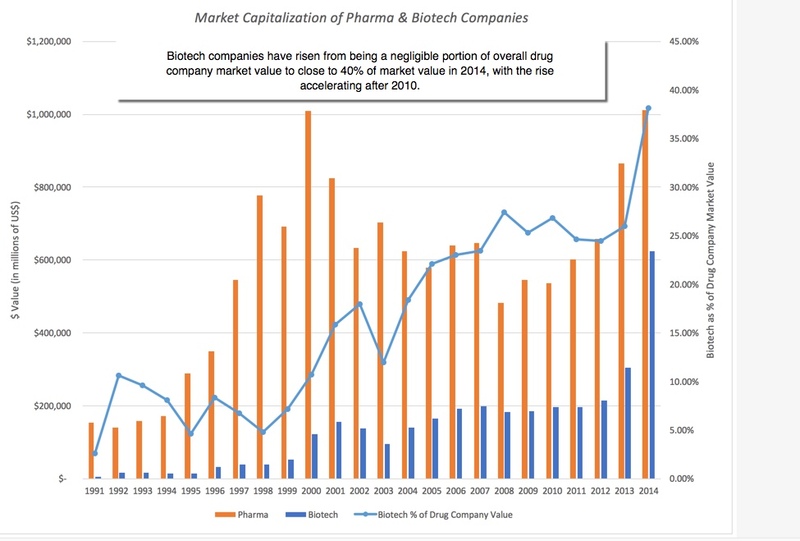 In 2014, biotechnology companies accounted for 38.16% of the total market capitalization of drug companies, up from 26.87% of value in 2010. 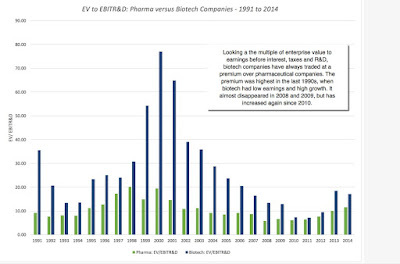 Biotech companies traded at huge multiples in the late 1990s, partly because they earned so little and were being priced for future growth. As they have became larger contributors to earnings in the drug business, the multiple at which they trade has come down and both groups traded at roughly similar multiples of EBITR&D in 2008 and 2009. 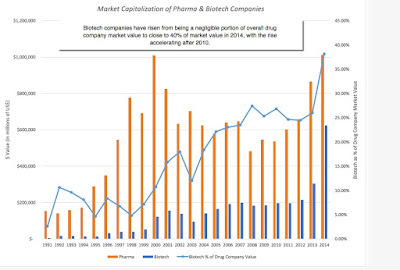 Since 2010, though, the multiple of EBITR&D at which biotech companies trade has risen relative to pharmaceutical companies. Just as the aging of technology companies has created more diversity in that space, an argument that I made in this post, the health care business is showing signs of aging. The older, more established companies in the business, for the most part, are in their mature phases, and not surprisingly, their focus has shifted to consolidation, capital structure changes and tax management. The younger companies in the space will increasingly carry the burden of investing for growth, but will have to be far more disciplined in their R&D spending than their older counterparts were two decades ago. If health care cost growth continues to be contained and drug company pricing power remains muted, you should expect to see less aggregate spending on research and development at drug companies. While that will undoubtedly provoke hand wringing on the part of experts, pundits and politicians, it is the logical consequence of a changing health care landscape.